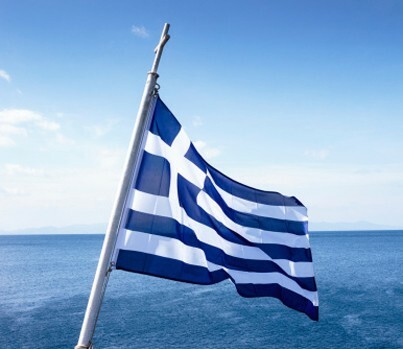 The national flag of Greece consists of nine horizontal stripes of equal width, five blue and four white, alternately, the first and last stripes being blue. The upper left corner contains a blue square, along the five stripes with a white cross inside it. The flag is hung on a white flagstaff at the top of which there is a white cross. The land flag used to be square in shape, and used to have a white cross on a blue background. The marine flags resembled the current national flag. The only difference in the flag of the merchant marine was the reversal of colors in the corner where the cross was (a blue cross on a white background). The flag of the merchant ships was ranked with that of the navy in 1828, when it was recognized that merchant ships had taken part in the war of independence as war-ships. From 1864 onwards the flag of the infantry regiments was made of silk with a gold fringe all round and had a picture of their patron saint, Saint George, in the centre of the white cross. The war flags currently are: for the navy, the national flag and, for the army and the air force, a rectangular flag consisting of a white cross on a blue background, the cross dividing the flag into four equal parts. In the centre of the cross, the flag of the army bears a picture of Saint George, while the flag of the air force bears a picture of the Archangel Michael.